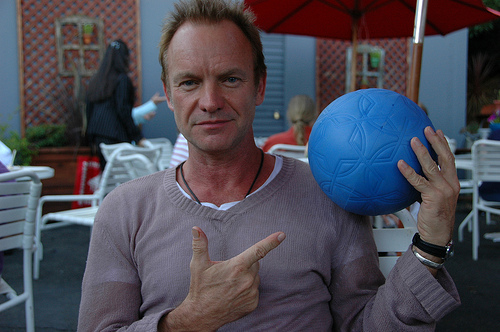 You are here: Home / EcoKids-Environment / One World Futbol: Where Do The Children Play? Anywhere. Update: July 13, 2014 World Cup Finals! Congratulations to Germany, who just won in extra time against Argentina to take the honor at The World Cup 2014. From media literacy lessons on what’s left out in news coverage, showing a brighter side of Rio vs the underbelly of tough truths (expecting even more ‘best foot forward’ coverage for the 2016 Olympics ahead) to the heartening excitement of nations coming together in a global event, it seems like a perfect time to reprise this post about the POWER OF PLAY and how we can ALL do our part to bring this indestructible ‘futbol’ to children worldwide. Original Post: June 1, 2011 Summer is here, schools are pouring kids onto the streets, and for those who live in urban cement jungles all too many will plug in to media to play… and tune out rather than get out. When I stopped by the One World Futbol booth at the Doof-A-Palooza event in Oakland’s Jack London Square, they were touting a GOGO model (Give One Get One) akin to the One Laptop Per Child concept, to pay it forward to communities in need and get kids’ keisters off the couches at the same time. As one who fielded popped balls and sad faces on weekly K-5 playground duty, pushing budget-impaired public school administrators to find a sturdier option that lasts more than one season, I thought, “they need to get this into U.S. schools, not just rugged terrain overseas.” The wild looking bladder and valve of the One World Futbol design enables the ball to be squished (even run over by a truck?) refilling itself when the air is released. Ironically, instead of visualizing the Darfur refugee camps which inspired the ball’s creation from a makeshift game using a bundle of trash tied with twine, my thought blink went to ‘think global act local’ reflecting on our own urban youth in the USA. Sting’s music in their videos inspires a global worldview, but the soundtrack my mind kept playing, “I know we’ve come a long way, we’re changing day to day, but tell me, where do the children play?” (Cat Stevens, aka Yusuf Islam) because I see TONS of utilization of basketball courts doubling as soccer fields, as well as open dirt lots and empty parking lots once the bridge and tunnel crowds retreat to the burbs. 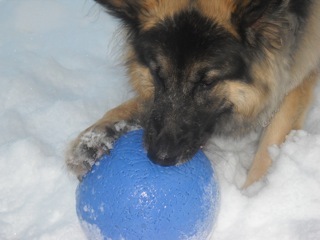 Seems like the perfect recreational use for this all-terrain ball. When people come together to pump up play, no one wants the good times to end, so a ball that doesn’t go flat fits well with the overall evidence of community-building through the Power of Play. As I wrote in this series about Playworks and Kaboom and other fabulous orgs bringing the creation of camaraderie and conflict resolution into environs to create safer spaces by engaging local players from the get go, there’s much to be said for the power of play to heal wounds and make change. There seems to be a visceral ‘ownership’ when play spaces are generated by the people themselves creating a self-protected positive version of NIMBY that’s akin to a ‘thug-begone’ nurturing deterrent. 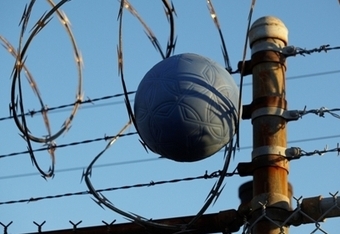 Maybe that’s why the One World Futbol Project was one of the three finalists for the 2010 Peace and Sports Awards (which began in 2008, interesting to read about the background). I mean, why would anyone swipe or trash or pop a ball and force game play to end, right? We saw this validation on the K-5 suburban schoolyards too…kids took EXTRA care of the balls designated by classroom with people ‘assigned to bring it out/put it away’ daily. Accountability. Dedication to the community. Ownership of the fun…LOTS of life lessons bouncing around one tough little blue ball that reminds me of our planet earth whirling around being kicked about and popping back to sustain itself. Here are FAQs about the One World Football Project …For less than two Jacksons ($39.50) you can buy a ball and give a ball to one of their partner programs bringing play and cooperative teamwork to impoverished communities around the world or right down the street. I’m ordering one now, because in our house alone, there’s a hammock strung from the garage ceiling brimming with balls of every sport in dire need of needles/pumps and TLC repair to get ‘em back in shape again, especially with two dogs who chase anything remotely poppable. Personally, I’d love to see new media bridge this universal play opportunity to educate about humanity within teaching contexts too. 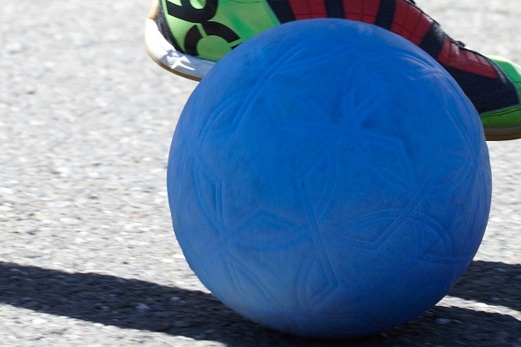 Schools could use One World Futbol as a socio-emotional learning project sharing play ‘across the miles’ in partnerships, like ‘sister city’ schools. It’s a great way to reach and teach with tangible assets in a planet pal approach to play, while sharing (via Skype? Blog posts?) what life is like on different continents to put a face and a ball together in allied spirit of fun. Here are some of the videos I found about the ball, I’ll let you know how it works out here. The only thing I do NOT understand is why it’s not being branded into oblivion, with Sting’s R&D backing, and Michael Vanderbyl creating the logo (harkening back to my days of yesteryear, I know that means they had some bucks or probono clout to play with) it should have far more mindshare even in its rather new launch of a year ago last summer. They’ve introduced the ball as a giveaway in Rwanda, Haiti and Iraq, their goal is to have over a million balls distributed over the next three years with the GOGO/BOGO model. Can’t wait to see if it’s got the bounce and playability to pass muster with the ‘first world’ teen soccer fans I’ll have put it through the paces. One thing’s for certain, the concept, uniting of nations, and oneness of play as a universal need make this worthy of a ‘positive pick’ for our series. The Power of Play, Part Three: Active Video Games in Schools?